Like our beloved Cubs, Chicago Lyric Opera is in the midst of a championship season. So far, Lyric is batting 4 for 4—after an exciting new Rheingold, a solid Lucia, and a splendid Les Troyens, on Saturday night was the opening of a completely satisfying production of Massenet’s late “heroic comedy” Don Quichotte. This production, directed with heart, passion, and attention to detail by Matthew Ozawa, was alternately warm, amusing, sentimental, and deeply moving, featuring extraordinary performances by the principals and chorus as well as a stirring and exciting reading from the Lyric Opera Orchestra under Sir Andrew Davis. After all the cynicism, bitterness, and rancor of the election and its results in the last few weeks, this reviewer found this touching tale of gentle romantic idealism and the redemptive power of love to be the perfect tonic. How wonderful that an evening at the opera can be so uplifting in the midst of these chaotic times. The production, from the San Diego Opera, was a marvel. It was one of those rare occasions when scenery (Ralph Funicello), costumes (Missy West), and lighting (Chris Maravich) worked together synergistically to make a production not only stunningly beautiful to see, but also completely in tune with the style of the music and the story. The inventive use of scrims, the starry skies, the warmly lit scenes in the village where Dulcinée rules hearts and minds, the brilliant windmill projections, and above all, Don Quichotte’s vision of Dulcinée riding on a star in his dying moments—all unforgettable visuals that enhanced and supported the story telling. It certainly showed that an unabashedly traditional production can still thrill an audience. What can be said about the great veteran bass Ferruccio Furlanetto? He was vocal and dramatic perfection in the title role that he has sung to acclaim in Toronto, San Diego, St. Petersburg, Madrid, and Palermo. He sang like a man 20 years younger, no wobble in his powerful sound, his every gesture elegant and sincere. It was a warm, generous performance straight from the heart of a great artist. He managed to balance humor and pathos in perfect measure. His death scene in Act Five was one of the most moving in memory. Nicola Alaimo as Sancho and Clementine Margaine as Dulcinée both made stunning Lyric debuts. Of course, the role of Dulcinée in Don Quichotte bears no semblance to the guttersnipe Aldonza in Man of La Mancha—here she is the great beauty of the town, sought after by all the eligible men. Ms. Margaine has a very impressive, earthy mezzo voice that’s perfectly capable of extending to strong high notes, and she uses it with style and grace. She balances the character’s haughtiness and glamour with her deeply sympathetic moments of sadness for the plight of Don Quichotte, especially in Act Four when she dismisses the Don’s marriage proposal with laughter, only to be seized with pity when she realizes that she has crushed his spirit utterly. This was my first hearing of Ms. Margaine, and I look forward to many more. She is capable of huge, dramatic mezzo power, yet is able to spin out impressive pianissimos in her quiet moments. At his first entrance, I was concerned that Alaimo’s Sancho was going to be overly bumptious and farcical, but he very quickly found the character’s heart and delivered a very funny, ultimately moving performance. 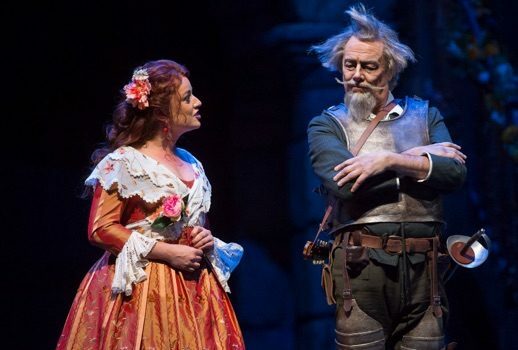 In Act One, his smooth baritone seemed a size too small compared to the power of Mr. Furlanetto and Ms. Margaine, but here, too, he found an extra gear beginning in the second act and more than held his own, complete with an exquisitely touching and emotional moment as he begs Quichotte not to die. The supporting cast was mostly excellent, especially Ryan Opera Center members Jonathan Johnson as Dulcinée’s suitor Rodriguez and Bradley Smoak, superb and riveting in the mostly-spoken role of the Bandit Chief redeemed by Don Quichotte. The wonderful Lyric Opera Chorus under Michael Black, as always, sang and acted with detail and precision, adding much life to the scenes in the town square. From the first stirring notes of the Spanish-flavored overture, Davis was masterful both in the grander moments of the score and in the deceptively simple and direct melodies. Only one shaky brass entrance marred a splendid performance from the orchestra. This opera, written very late in Massenet’s life, is graced with wonderfully simple musical textures (like Quichotte’s serenade to Dulcinée) as well as frenzied ones (the Windmill Scene) and moments of nobility and spirituality (the redemptive ending of Act Three). I found that the piece more than equals the musical landscapes of his better- known operas Manon, Werther, and Thais. I suppose it is rarely produced because of the difficulty of casting the title role (Massenet wrote it for the great Russian bass Chaliapin). This would seem an ideal production for families and for introducing a newbie to opera, given its familiar story, positive outlook, and concise length (less than 2 ½ hours including intermission). To me, this performance was a testament to the power of opera. I left the Civic Opera House feeling uplifted, moved, and quietly delighted that there is still a power in innocence, romance, and idealism in this world.